DURING the 19th century, there seem to have been seven or eight other foundries operating in the City, but information concerning them is very scanty. A good deal of uncertainty surrounds the early story of the additional unit of the Golden Hammer, the riverside firm of Taylor & Bodley. There is extant a surviving price book issued by the firm in 1867, quoting for gear wheels and giving the year of the firm's opening as 1801. The book does not mention the actual founder of the firm, and directories of that date show only George Bodley, already noted as a maker of patent cooking ranges. His foundry is reputed to have begun working in 1790, in Quay Lane, Shilhay. Bodley Bros. (Exeter) Ltd., the direct descendants, maintain the original premises in operation to-day. Trade directories provide the only clue to the early story of Taylor & Bodley. For instance, one W. Northam is listed in the 1816 directory as a whitesmith in Bartholomew Street, and nine. years later James Northam's name appears as an ironfounder of Shilhay. This undoubtedly refers to Taylor and Bodley's old premises which were at the entrance to Shilhay and were known as "Northam's Foundry. "The fact is commemorated in the present company's telegraphic address – "Northam's, Exeter." At the Quay Lane Foundry, George Bodley was followed in 1833 by Alfred and W. C. Bodley. The arrangement evidently broke down, for before 1841 Alfred Bodley left the firm, to start a separate foundry in Commercial Road. Similarly, W. C. Bodley is listed as having yet another foundry in Bonhay Road. Presumably there were other Bodleys who carried on at Quay Lane. In 1858 Northam's Foundry was taken over by two partners, Christopher Mardon Taylor and William Ford, but this alliance broke down in 1863, and Taylor continued running the business on his own account for three years. A further reshuffle must have taken place among these foundries in 1867, because in that year Alfred Bodley apparently joined Taylor in Northam's Foundry, the firm being then renamed Taylor & Bodley. At the same time, the Quay Lane foundry was first listed as being owned by Bodley Bros., and these two designations still survive to-day. Alfred Bodley's family was brought up in the house beside the foundry, and the late J. H. F. Nichols, a director of the firm, provided some interesting sidelights on the two partners and their relationship with each other. It appears to have been a stormy alliance, with constant quarrels. For a considerable time the partners would not speak to each other, nor would they ride together in the firm's cart ! However, Alfred Bodley seems to have been a man of great ability-Mr. Nichols considered him the best water engineer in the South-West, and Alfred built many water-wheels throughout Devon. Christopher Taylor also had claims to engineering fame, through his patent multi-gear capstan for yachts. Alfred Bodley had retired by 1897, and Taylor was then joined by a new partner, Alan Barcham Green, a young Maidstone man of 31. Green was a man of unusual attributes. He had been trained for the Church, but after graduating at Cambridge he decided that engineering was his true vocation. Paper-making was the family industry-A.B.G. himself was born at Hayle Mill, Maidstone, Kent, as the tenth of a family of eleven children, and the youngest of five sons. Hayle Mill still operates under the family as "J. Barcham Green, Ltd.", producing hand-made and special types of paper. Two other well-known paper-mills, in Buckinghamshire, also are associated with the Green family. A.B.G. led a full life ; he travelled widely, especially in northern countries, he was a great sportsman, and a skilled wood-carver. His youngest daughter, Miss M. Green, who has provided valuable information on her versatile father's activities, still has many of his carvings, carried out in 13th century oak salvaged from Maidstone Parish Church. The arrival of Mr. Green at Taylor & Bodley's established a considerable connection with the paper trade, which was subsequently maintained under the Golden Hammer. Soon after A. B. Green's entry, Mr. Nichols began his service with the firm, as a boy in 1901, and when in after years Green turned the business into a Limited Company, Nichols, by then his right-hand man, was appointed a director. A.B.G. 's nature appears to have presented a paradox- Nichols says that he sometimes appeared to be hard, and at others extremely kind and forgiving, as in the case of the thieving furnace-man. The latter was found to be selling non-ferrous metals from the firm's stock, and was remanded in custody. A.B.G. bailed him out, kept him on until the trial, and gave the man's wife an allowance while he was in prison. When the furnace man was released, Green re-employed him, and was served faithfully until the man's death. The partnership of Green and Taylor was almost as stormy as the Taylor-Bodley alliance. Green lived with his partner for a short time, but they seldom agreed ; A.B.G. seemed to think that his share was dearly bought, though Nichols records that A.B.G. had brought his own valuer at the outset, a Masson-Scott paper-machine expert. However, Taylor retired in 1900, and Green ran the business thereafter on his own account for nearly 40 years. The firm had always specialised in gear wheels, though the majority of the other work --agricultural, ship, and domestic castings, and, in the machine-shop, engine repair, etc.-was done for Devonshire customers. About 1902, E. A. Morss, formerly of Bodley Bros., went over to Taylor & Bodley's, and the latter firm was then able to begin the machine moulding of gear wheels. Though a large floor-type machine had been in the foundry for some time, no one had known how to use it, but when Morss arrived he brought with him one of Bodley Brothers' moulders, who knew the machine. This incident naturally caused much bad feeling between the firms. Morss also designed for his new associates their first table-type gear moulding machine. After the outbreak of the 1914 war, Taylor & Bodley's enjoyed a considerable increase in business, which came chiefly from the paper-making industry-Mr. Green's wide connections in the latter must be remembered. A. B. Green's long-standing friendship with the Holladay family dated from about 1909, at a time when Exeter foundries had made a price agreement for ranges supplied to the City Council. Garton & King received no orders at all, so there was a strong suspicion that someone was breaking the agreement by under-cutting the price. At length, written proof of this fell into the hands of the firm by the merest chance, so on the next tender Garton & King submitted a cut price and gained the contract. The sequel was that a deputation of the other foundry owners, headed by Mr. Green, marched with a great show of indignation to the offices of the Golden Hammer. Here they were confronted by the imperturbable Edgar Holladay, and when Mr. Green asked whether the news regarding Garton & King's price-cut was true, Edgar replied that it certainly was. When the tumult and the shouting had died, the irate Mr. Green further inquired the reason for his action. Whereupon Edgar cooly produced the evidence that he was simply following suit, which neatly removed the wind from his visitors' sails. The business outcome of the disclosure was the voluntary abandonment of the agreement, and A. B. Green declared that Edgar Holladay could not be blamed for his action. A very pleasant corollary to the affair was the friendship that ripened thenceforward between A.B.G. and the Holladays, featuring a regular game of bridge played nearly every Saturday evening. Green had no son or near male relative, so when, in 1937, Taylor & Bodley's became a Limited Liability Company, A.B.G. asked Henry Holladay, Edgar's elder son, to become one of the directors. In this way Henry proved himself a worthy successor to the earlier men of the Golden Hammer-as director of two Companies, and later as Chairman of the City's Chamber of Commerce, thus maintaining the tradition of public service. A. B. Green retained the controlling interest in the new Company until 1943, when he finally decided to give it up. Garton & King then purchased this and assumed control. Taylor & Bodley's had been making a special capstan known as a "Dandy Score." This line dated from Taylor's work on his patent capstan, and soon after the changeover a strange coincidence occurred. An order for a capstan came in from a Ramsgate firm of boat-builders, Charles H. Holladay ! The owners proved to be distant relatives, for Henry Holladay's great great-grandfather, whose namesake he was, had been a master-plumber in Ramsgate. Apparently the Ramsgate boat builders were descended from one of the master-plumber's brothers. It was also strange that Edgar Holladay should have renewed the connection with the plumbing trade when he joined the Golden Hammer. 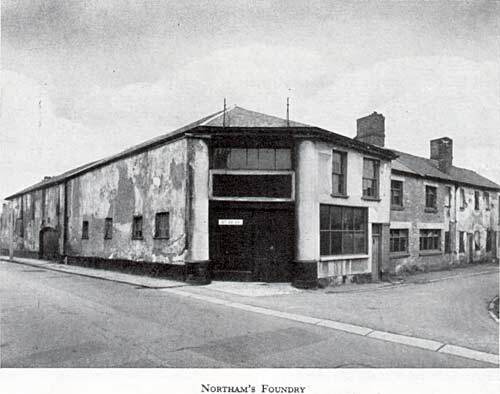 When the Tan Lane premises had been extended and reorganised in 1945, the controlling Company moved the entire equipment and the workers from Northam's Foundry to new quarters in Exeter Foundry.